The item Brute strength, Susan Conant, (electronic resource) represents a specific, individual, material embodiment of a distinct intellectual or artistic creation found in Austin Public Library. The new 'Holly Winter' dog mystery - When Dog's Life columnist Holly Winter rejects applicants who want to adopt homeless dogs, she makes a lot of enemies. 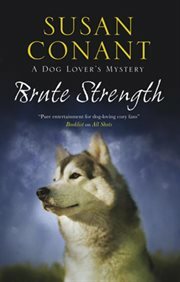 In dogs Holly trusts, and the dogs she trusts most are her beloved malamutes, Rowdy, Kimi and Sammy. But right now she could use a human friend. Lately, it seems wherever she turns, things go wrong: an anonymous call turns vicious, her husband is keeping secrets, and acquaintances die under mysterious circumstances. Then Holly's own life is threatened. Can the brute strength of Rowdy, Kimi, and Sammy protect her?